Many of you have been asking questions about our red blood cell research. For this #OMFScienceWednesday, we examine the difference between RBC shape and RBC deformability, and how they relate to blood flow. You may have seen an image of a red blood cell (RBC) in the past: it is a small, pink disc, lighter in color in the center than around the sides. It looks lighter in the center because the cell is thinner there, allowing more light to pass through. However, red blood cells can come in many shapes and sizes besides the familiar disc. While some variation is natural and healthy, certain shapes can indicate disease. The most familiar example is in sickle cell anemia, where the red blood cell develops a sickle, or half-moon shape. The shapes of red blood cells are distinct enough that each has a specific name, and it is hard to mistake one shape for another, with few exceptions. Some unhealthy red blood cells develop spikes or protrusions. These are called acanthocytes (shown below) and can indicate hypothyroidism, liver disease, or abetalipoproteinemia. Cells with shorter, rounder, symmetrical protrusions are called echinocytes or burr cells, and may also be evidence of disease. Echinocytes may indicate uremia, pyruvate kinase deficiency, low magnesium, or low phosphate. Unfortunately, it’s hard to be completely certain when patients have echinocytes in their blood: some common preservatives or dyes, like EDTA, can turn completely healthy red blood cells into echinocytes! The cell membranes in red blood cells are made up of proteins, fats, and carbohydrates. This means that abnormalities in the cell membrane can be a good way to spot disordered metabolism of these nutrients. Issues with producing too much of a certain metabolite, or not being able to break down a nutrient can cause abnormalities in the cell membrane, which lead to irregular shapes of RBCs. For example, echinocytes are so strangely shaped because cholesterol adheres to the outside of the cell, creating their sunflower-like appearance. 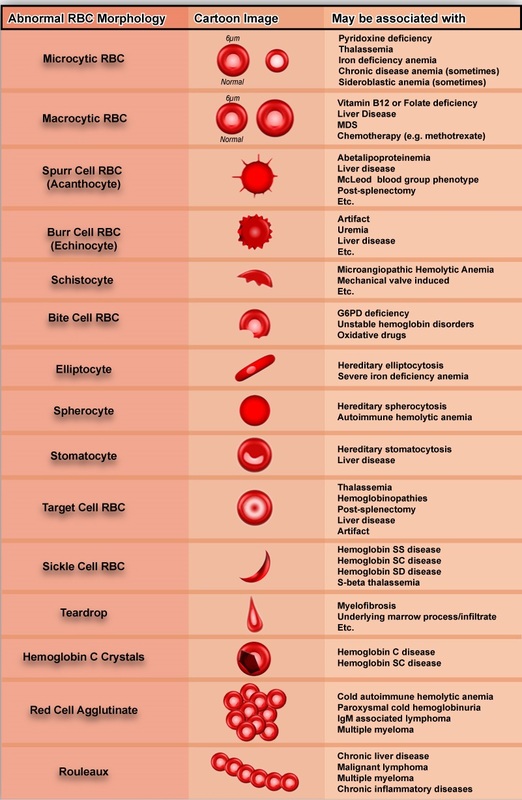 Click here to see all the abnormal shapes of red blood cells and some of the diseases in which they are found. Deformability is the ability of a red blood cell to change shape when it squeezes through a small space, like a capillary. Capillaries can be as small as 3 micrometers (um) wide, while a healthy red blood cell is between 6 and 9 micrometers wide. Red blood cells must pass through openings narrower than they are, and that means red blood cells have to deform quite a bit to make it through these tiny passages! Like red blood cell shape, deformability also depends, in part, on cell membrane composition. With the right fats, carbs, and proteins in the cell membrane, red blood cells should be able to deform to make their way even through the tiniest blood vessels. Without the right components in the cell membrane, however, the cell membrane can become stiff enough to slow blood flow, or even fragile enough to rupture under pressure. Red blood cell shape and deformability may be able to help us understand issues with blood flow in ME/CFS, since both shape and deformability have an effect on blood flow. While there are older studies on blood flow and RBC deformability in ME/CFS, there are now new and more accurate technologies we can use to measure deformability and blood volume. Scientists at the Stanford Genome Technology Center and San Jose State are working together to develop a sensitive assay to measure RBC deformability by examining flow through artificial capillaries. Using these new techniques, we can more closely examine blood flow to determine whether or not it is compromised in ME/CFS. Understanding why red blood cells in ME/CFS may have unusual shapes or compromised deformability may connect to the metabolic abnormalities we have seen in some studies. Understanding this aspect of ME/CFS pathology can help us learn more about the ME/CFS disease process as a whole, and lead to a diagnostic assay that clinicians can add to their diagnostic toolkit.